The Switched Port Analyzer (SPAN) feature, which is sometimes called port mirroring or port monitoring, selects network traffic, from a switched port, for analysis by a network analyzer. Unfotunately this feature works only on switches or switches Layer3. And in a router, what can I do to copy the traffic? In a previous article, I explained the Embedded Packet Capture, a powerful feature to capture data packets directly on the NVRAM. Another good solution is the ‘IP traffic export‘. Introduced in 12.3(4)T IOS, the IP Traffic Export feature allows users to configure their router to export IP packets that are received on multiple, simultaneous WAN or LAN interfaces. The unaltered IP packets are exported on a single LAN or VLAN interface, thereby, easing deployment of protocol analyzers and monitoring devices. 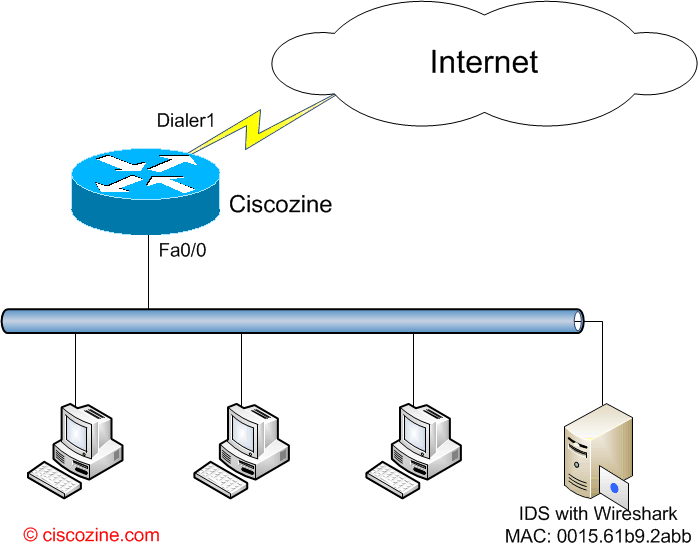 Suppose that you would copy the Dialer1 traffic to the IDS host (Mac address: 0015.61b9.2abb). The bidirectional command exports incoming and outgoing IP traffic on the monitored interface. If this command is not enabled, only incoming traffic is exported. The interface commnad specifies the outgoing interface for exported traffic. The mac-address command specifies the 48-bit address of the destination host that is receiving the exported traffic. After that, the router will start to mirror the IP traffic to the host. Remember: When IP traffic export is enabled, a delay is incurred on the outbound interface when packets are captured and transmitted across the interface. Performance delays increase with the increased number of interfaces that are monitored and the increased number of destination hosts. Remember: If you want clear the packet capture buffer for the designated interface, use the traffic-export interface clear command. The IP Traffic Export feature allows users to configure their router to export IP packets that are received on multiple, simultaneous WAN or LAN interfaces.